We have every kind of fence here at Hercules of Richmond, and one of our specialties is ornamental steel fencing. Our ornamental steel fencing has the look of classic wrought iron style with the strength, durability, and easy maintenance of steel. Rather than painting this style of fence, we use powder coating applied using an electrostatic process that with outlast paint. You can choose from many colors and styles, and we even have custom welded panels for a design that you can create. And with our 12-15 year warranty, your fence will be guaranteed to be protected. 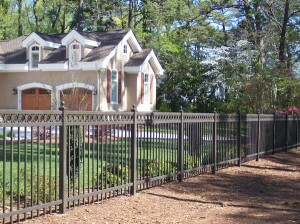 Check out our ornamental steel fencing options here. This entry was posted on Thursday, September 26th, 2013 at 9:13 pm. Both comments and pings are currently closed.